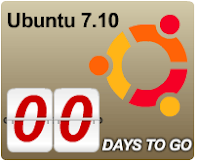 Ubuntu 7.10 the latest offering from Canonical, named Gusty Gibbon has been released. This is touted as one of the most important releases ever by Canonical mainly because a number of enhancements have gone into it which were lacking in previous versions. Improved devices support such as Printer, WiFi, Digital Camera, iPod and so on. Read write access to Windows NTFS partition by default - In earlier versions you couldn't save files to the NTFS partition. 3D Effects are enabled by default - But will be disabled automatically on systems which do not meet the minimum requirements. I think perhaps they might be using Nouveau device drivers. Novell's Aparmor security has been incorporated. Aparmor is a name based access control which does the same job of selinux but is claimed to be much easier to configure. And finally integrated desktop search using Tracker. Of course apart from those listed above, there are a number of subtle changes such as a GUI for XOrg server configuration and so on. All in all, there is a general expectation among Ubuntu users and Linux lovers in general that this release of Ubuntu is going to be one of the best releases so far. I had covered the expected features earlier. You can download the latest version of Ubuntu namely ver 7.10 Gusty Gibbon from the following location. Or you can also choose from a list of mirrors closest to your geographic location. As for me, I am off to download Gusty Gibbon to install on my machine. You can look forward to my personal opinion about this much touted release from Canonical soon. Though, what would really interest people like myself is (i think) : i already have Ubuntu 7.04 installed, how exactly do i (painlessly) upgrade to 7.10 ? That would be great to know..
Now if only I could get it to update itself from 7.0.4 I would be happy. 1) open Synaptic (or Adept for Kubuntu or Xubuntu), click on RELOAD, then click on UPDATE EVERYTHING AND CONFIRM. The parent post has a link to all the info needed for upgrading. I have been running it on a Thinkpad T60p successfully and it runs a several degrees cooler (cpu and gpu). The compiz update is incredibly useful (expo, scale, opacify, negative, add helper). Make sure you read the release notes because suspend doesn't work with some ATI laptops! !